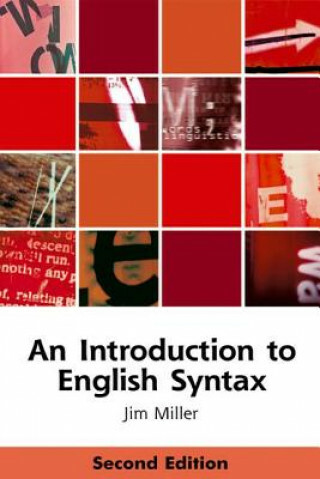 REVIEW FROM PREVIOUS EDITION: 'A slim and useful student textbook for English Syntax. Although most of the examples are from English, the book introduces general concepts which provide the necessary tools for a basic syntactic analysis of any language. The book concentrates on topics that will remain useful to the student who does not go on to study linguistics but, say, literature or EFL teaching.' - The Year's Work in English Studies In this revised and fully updated new edition of his popular textbook, Jim Miller discusses the central concepts of syntax which are applied in a wide range of university courses, in business communication, in teaching and in speech therapy. The book deals with concepts which are central to traditional grammar but have been greatly refined over the past forty years: parts of speech and how to recognise them, constructions and their interrelationships, subordinate clauses and how to recognise the different types, subjects and objects, Agents and Patients and other roles. The book draws out the connections between syntax and meaning and between syntax and discourse; in particular, a new chapter focuses on the analysis of discourse and the final chapter deals with tense, aspect and voice, topics which are central to the construction of texts and are of major importance in second language learning. They are also areas where meaning and grammar interconnect very closely. Key features: *Coverage of central themes with a wide application outside the study of syntax *Explains basic concepts, supported by a glossary of technical terms *Exercises and sources for further reading provided.